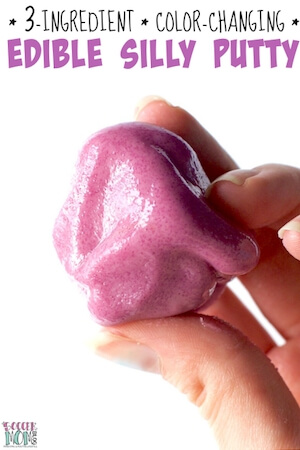 This edible conversation heart slime is super wiggly and jiggly and it’s taste-safe! 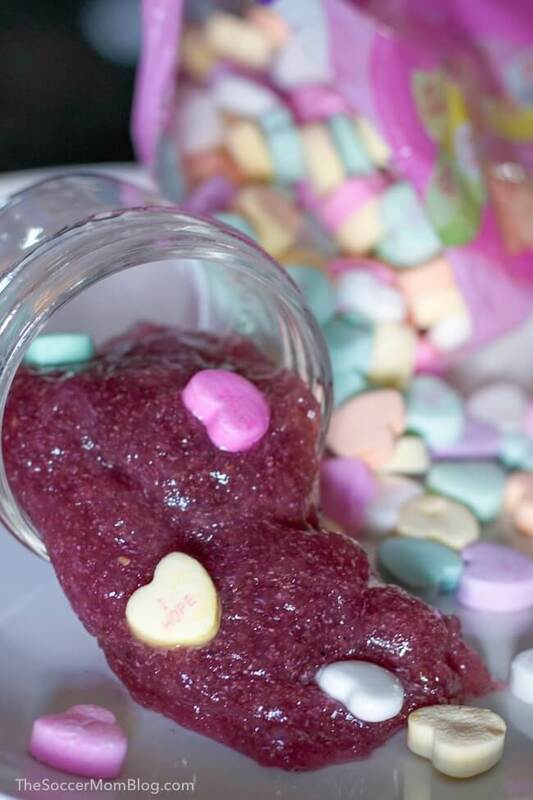 Such a fun Valentine’s Day sensory activity for kids! Every holiday we create a new edible slime recipe, but it isn’t always easy to think of new ideas! To brainstorm a Valentine’s Day slime recipe idea, we hit the candy aisle at the grocery store. So many different candies! But which would actually work to make slime? We’ve already used gummies in our gummy bear slime, and we used Starburst to make our Halloween edible candy slime. So I bought two bags and brought them home to experiment. Before I had a chance to do so, my mom came over for a visit. When she saw all the candy, she asked what we were planning. Edible Valentine’s Day Slime of course! I said, so proud of our creativity. Cinnamon candy. Hot. Kids rub eyes. Doh!! Somehow in my excitement I failed to imagine the potential disaster of making slime with red hot candies. Thank goodness my mom stopped me before I put that recipe out into the world! 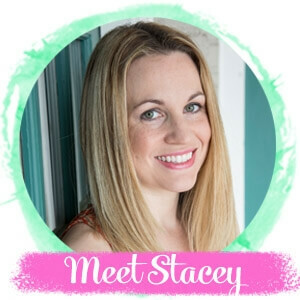 I got enough mean comments about Pizza Slime (seriously, who knew slime could offend so many people) – I don’t even want to think about the mail I’d get for a slime that actually is a bad idea! Then I remembered one of the edible slime recipes in our Slime Book that uses psyllium husk (which is clear). What if we incorporated psyllium husk for our stretchy slime activator, and decorated it with traditional conversation hearts? As the hearts dissolve, they’d create a fun rainbow tie-dye effect and the slime would change colors. 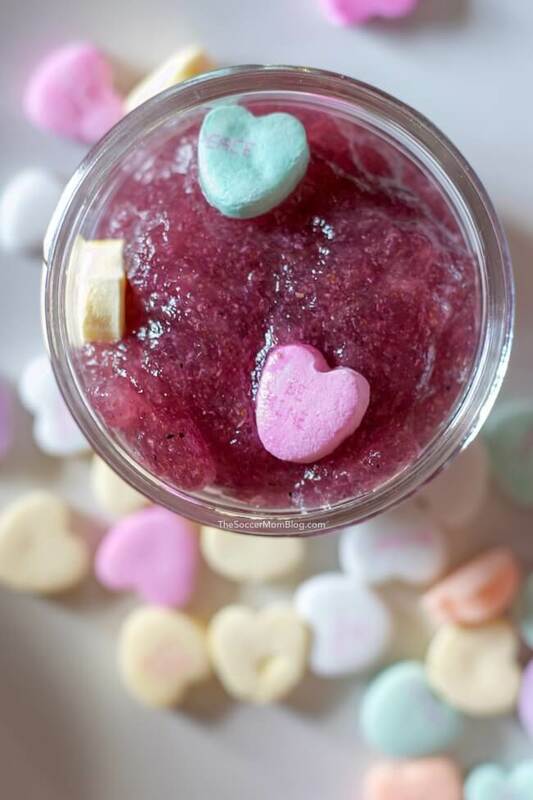 So much cooler than my original edible Valentine’s Day slime idea!! This recipe rocks because you only need 4 simple ingredients that you might already have in your kitchen! 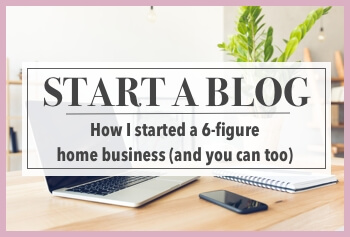 I’ve included affiliate links for your convenience; disclosure policy here. 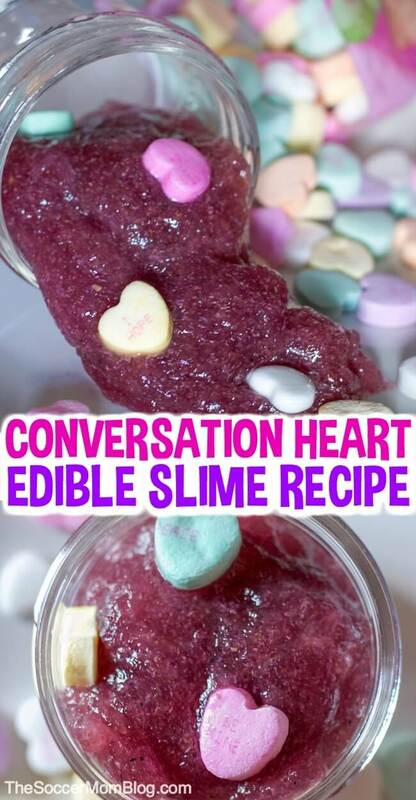 A free printable copy of this Valentine’s Day Conversation Heart Slime recipe is available at the bottom of the post, along with an easy video tutorial! Make sure you use a BIG mixing bowl and that it is microwave safe. Your slime will bubble up when cooking, so you want to give it plenty of room to expand. While microwaving, watch your slime carefully, as it may expand a lot. If it nears the top of your mixing bowl, pause the microwave until it settles, then resume cooking. An adult should remove the bowl from microwave when it’s done cooking, as the bowl may be hot. Make sure the slime cools to room temperature before giving to kids to play. Add in conversation hearts and have fun! 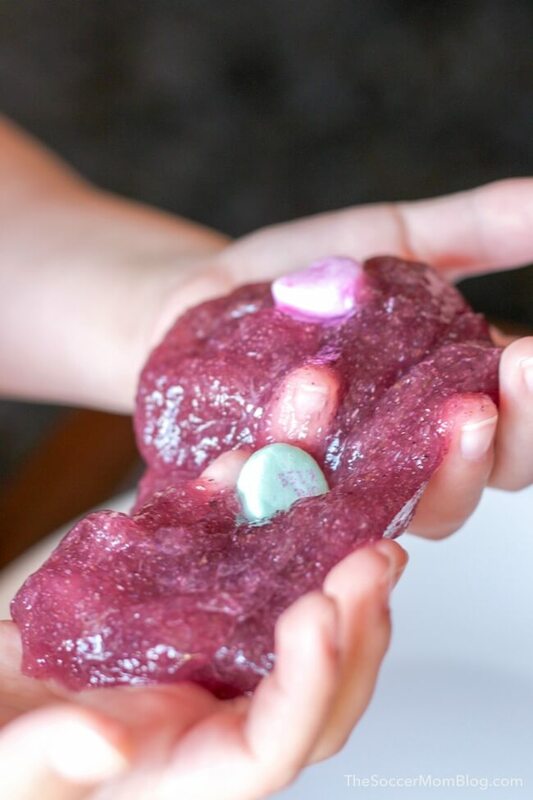 This edible Valentine’s Day slime is SUPER slippery and wiggly, so the conversation hearts may fall out. We recommend playing over a tray or large bowl to catch them if they slide out of the slime. 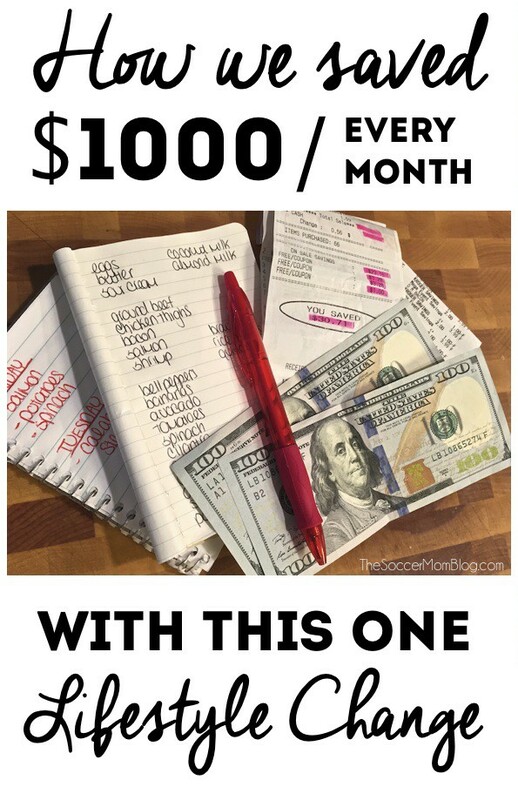 Feel free to add sprinkles or any other edible goodies! Note: While this slime is technically edible, it probably doesn’t taste very good, and is not meant to be consumed as food or in large amounts. We made it to be a taste-safe alternative to glue and borax based slimes. Always supervise kids when making and playing with any slime. 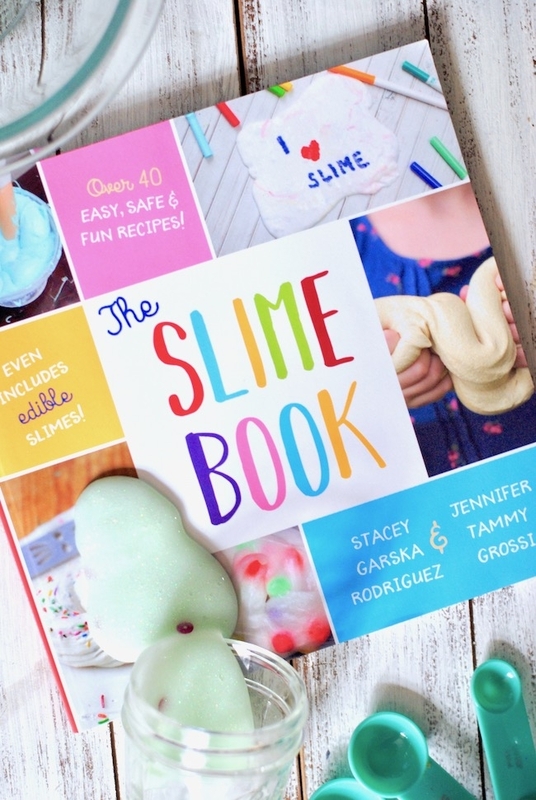 Related: Click here to see ALL of our edible slime recipes for kids! 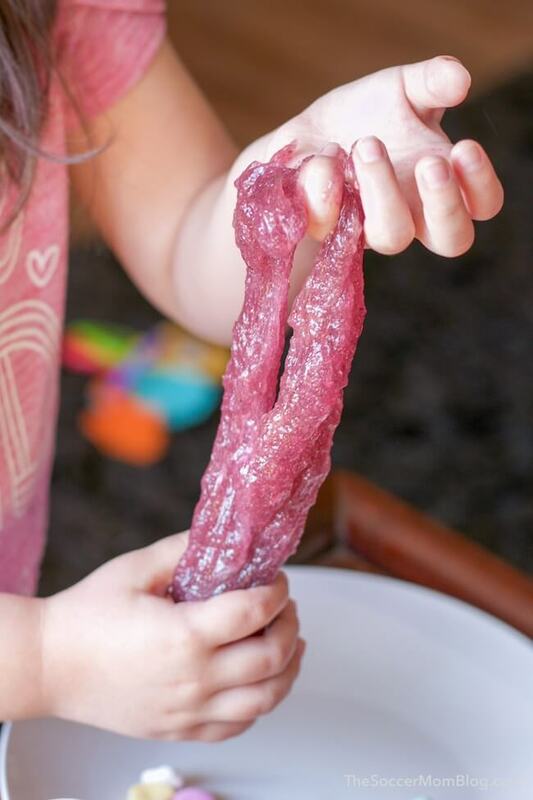 This edible conversation heart slime is super wiggly and jiggly and it's taste-safe! 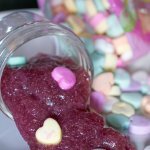 Such a fun Valentine's Day sensory activity for kids! 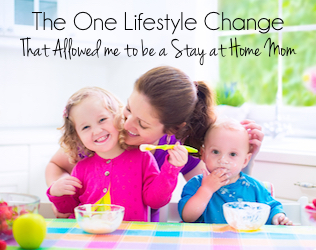 Combine psyllium husk and water in a LARGE microwave-safe mixing bowl. Add 1-2 drops pink food coloring. (It may look light, but slime will darken in color after cooking). Whisk quickly for about 30 seconds until mixture gets a bit frothy. Microwave for 4-5 minutes, watching closely. If mixture starts to bubble up near the top of your mixing bowl, pause cooking and allow it to settle before starting the microwave again. Carefully remove bowl from microwave and stir for 20 seconds. (Adults should handle this step). Allow to cool to room temperature and add a handful of conversation hearts.